Here you may also find more information about the destination and we are happy to meet you in our base and welcome you to our office in Marina Kremik Primošten. The Kremik Marina is located in a picturesque bay surrounded by hundred year old vineyards that produce the famous Babić wine. Located south of Šibenik, and set snugly into the land, this marina is certainly one of the most by nature protected marinas in the whole Adriatic coast and offers sailors and motorboat owners security and protection during their summer holidays. Marina Kremik is directly connected with Dalmatian coast road. Distance to Split Airport is only 30 km about 35 minutes transfer and Zadar Airport is 111 km with about 65 minutes transfer. For safety of our guests, berths in marina have fingers so that our guests have easy berthing. Besides finger berths marina has also mooring places for bigger yachts. The marina has 393 berths (moorings and finger moorings) in the sea and 150 on dry land, each one of which is supplied with water and 220 V/380 V electricity. Sanitary facilities are open 24 hours.The marina is well lit and secured. Of its facilities we might mention the reception, restaurant, market, nautic shop, technical service with a complex workshop, and a petrol pump and taxi service. 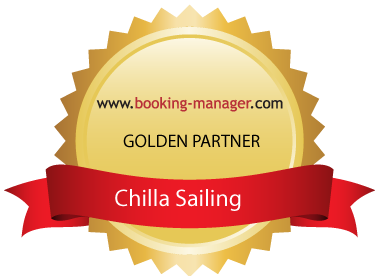 All lovers of the sea will certainly find Chilla Sailing and the Kremik Marina one of their favorite ports. The restaurant has approximately 130 seating places both in the interior and in the exterior part, the exterior being very suitable for summer season. The restaurant is fully air-conditioned, thus offering our guests the maximum of comfort. In the Kremik Marina there is a self-service grocery store. The working hours of the store are from 07,30 a.m. to 08,30 p.m. during summer season. For guests of the marina, we organize delivery of groceries to the boat. In addition, according to your order we can equip your boat.